The ostensible successes of this sport-for-development organization are complicated by several issues which were gleaned through my participant observations with them over a series of months in mid-2016. I will analyze how this group of young Maasai compete for the benefits provided by donors both amongst each other and with the donor itself. This paper also describes how the competition for scarce resources is intensified by the racialized structures that Maasai must navigate in order to profit from donor programs. Recent conflict between pastoralists and white landowners in Laikipia underscores the fact that community-based conservation has done little to ameliorate poverty among Maasai. As Maasai men are often represented as archetypes of ‘noble savagery’, they must sometimes reproduce the gendered racial stereotypes which development programs often claim to work against (Galaty 2002). The first section of the paper explains the origins of the Maasai Cricket Warriors and how they’ve been styled as champions of women’s rights despite the challenging nature of effecting successful gender work in a patriarchal community. The second section describes a tournament in Laikipia in 2016 to which the team was invited to play. I explain how the journey out of their community and across a racialized landscape challenges the ability of these men to represent themselves positively and forces them to succumb to various negative, gendered stereotypes. In the third section, I discuss how the team and the programs its involved with are being utilized by select members to gain access to livelihood opportunities in awkward accordance with how their partners envision. These ‘opportunities’, however, are not accessed equally by all members, and the team’s goals of effecting legitimate social change is overshadowed by the un-officiated competition for limited economic windfalls. Il Polei Group Ranch on the northern edge of Laikipia County has been a centre of baboon research since the mid-1980s, driven by the work of California-based research initiative, The Ewaso Baboon Project (EBP). As researchers working with EBP often form bonds with the young men they employ, some have tried to show their thanks by spearheading small development projects or helping connect the community to a donor or sponsor. One project manager who worked with EBP in the mid-2000s, an accomplished South African female cricketer named Aliyah Bauer, began teaching young men cricket as an after-school activity. With her connections in South Africa’s cricket community, Bauer was able to secure the sponsorship of an organization called Land Man Standing (LMS). LMS works to promote cricket in Africa by introducing a more spectator-friendly version of the game, and promoting its accessibility for lower income communities. Support from LMS helped the Warriors evolve into an organized sporting entity. LMS helped provide the team with equipment, media exposure, and several trips to South Africa to participate in cricket exhibitions. Soon after forging a relationship with LMS, the team experienced a falling out with Bauer, believing she had made promotional deals without their knowledge. Despite the travel opportunities that playing cricket has afforded them, most of the team’s members continue to live a subsistence lifestyle. Though some older members work in local government or as baboon trackers, most of the team are jobless. 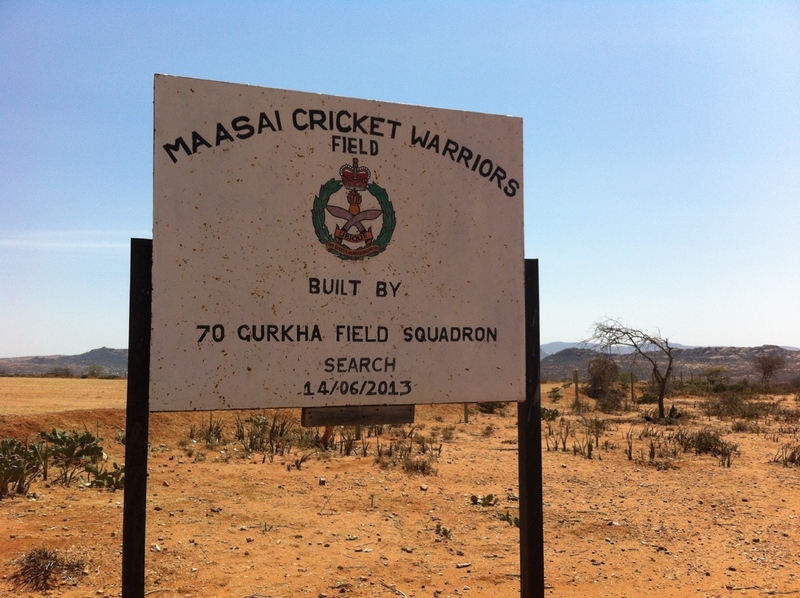 Sign marking the Maasai Cricket Warriors’ field at Il Polei Group Ranch. Despite a lack of resources, the team claimed to be feeling strong as I commenced working with them in April of 2016. They were preparing for a tournament at the famous Ol Pejeta Conservancy where they would compete before a large crowd against several of the best amateur cricket teams in Kenya. They were excited by the return of their star bowler Mpati, an energetic young player who was coming off a six-month suspension for becoming drunk and embarrassing the team on their trip to South Africa the previous summer. Ledama, the team’s assistant captain, explained that the Warriors had a constitution which they took very seriously. No member was allowed to put himself above his teammates and acting selfishly was grounds for suspension or dismissal. As the Maasai Cricket Warriors are an all-male organization, their constitution was also an opportunity to present themselves as agents of social change. Since ignoring gender issues in the modern era of development is to make oneself virtually ineligible for funding, the team’s primary social objective was to advocate for the rights of Maasai women by discouraging the practice of Female Genital Cutting (FGC). Though FGC is a legitimate challenge in Maasai communities, the team’s attention to this tremendously complex subject poses questions of feasibility and intention. It is well established that donor institutions working with Maasai often place an inadequately informed and carelessly executed emphasis on gender. According to Hodgson (1999, 122), the “ambivalent attitudes of Western actors towards prosaic aspects of Maasai culture has led communities to be politically and economically consolidated in a manner that insists upon masculinity as fundamental to Maasai culture.” By taking their warrior identity and deploying it in defense of women, the team could be seen as ‘working on’ gender issues without having to confront the issue directly. When I asked the team about the specifics of their gender work, Olenku, the lead captain, conceded that they had never conducted any work to reduce FGC in Il Polei because the elders would not permit it. Instead their goal was to raise awareness globally and hope that foreign pressure would lead to policy reform. About one week before the tournament, Ledama asked me if I would act as the team’s driver for the event. Though Il Polei is less than two hours from Ol Pejeta, the journey would involve traversing one of Africa’s most enduringly colonial landscapes. While most of Kenya’s farmlands were returned to Africans at independence, Laikipia has remained mostly in the hands of white Kenyans and foreign owners, many of whom combine cattle ranching with wildlife conservation and safari tourism. Maasai who claim an indigenous right to Laikipia live only in fragmented parcels on the county’s dryer peripheries, and though many large ranches try to assist Maasai by supporting local schools or clinics, ceding land to assist Maasai communities is never treated as a legitimate possibility. The event was to commence on the evening of a Friday and I met the team that afternoon at their practice pitch at Il Polei. As the team assembled their equipment, Ledama asked how much money I would be charging to transport the team to the tournament. I explained that since I would be conducting research the use of my vehicle was a donation. I would be happy to receive a few thousand shillings for diesel, but otherwise wanted no money. Ledama explained that LMS had allocated 20,000 shillings to hire a bus to take them to the tournament. He asked if I would agree to tell the organizers that I wanted the full amount. Ledama would give me money for diesel and that he and the team would keep the rest. I was uneasy but agreed. Entering into this private nature reserve was a surreal experience for myself and many of the Warriors. While dominating the Laikipia plateau, Ol Pejeta is surrounded by smaller parcels of subdivided land held back by an electric fence. On the north-eastern edge of Ol Pejeta is a region called Endana, where many members of Il Polei Group Ranch have migrated in recent years in search of better pastures. The fence line between Ol Pejeta and Endana represents a deep social and ecological rift. While the plains of Ol Pejeta feature grasses thick enough to conceal whole herds of zebra, Endana has been degraded down to its bare, black soil. Witnessing the plenitude of Ol Pejeta alongside men unable to feed their own livestock was unsettling. 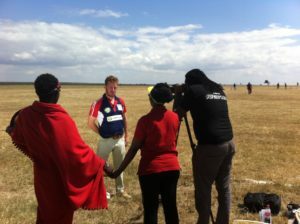 The following morning the tournament got underway on a large plateau in the centre of the game reserve. A crowd of almost exclusively white spectators – a mix of landowners from Laikipia and expatriates from Nairobi – congregated under a large tent where food and beer was sold. Herds of gazelles grazed to the sides of the pitch, with the snow-capped Mount Kenya setting an idyllic backdrop. 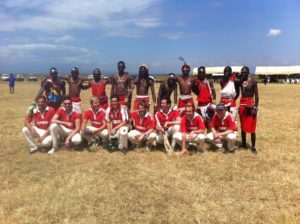 The Warriors took to the pitch in their finest Maasai regalia – over which they strapped shin pads and protective gloves. The Maasai played two matches on Saturday, one against a team of white Kenyans from Nairobi and one against a team from western Kenya. The Warriors lost both, and were extremely disappointed. To ease their disappointment, their white Kenyan opponents offered to buy the Warriors sodas or beers. The offer of a drink came with the obligation to socialize, and so the Maasai joined the spectators inside the large tent. The conversations between the Maasai and their white Kenyan opponents were cordial but patronizing. The whites made many jokes about Maasai polygamy, asking how many cows they would need to marry the Maasai’s sisters. Some team members seemed comfortable in the environment, while those with weaker English struggled to grasp the whites’ sense of humor. During this reception, I had an opportunity to speak with Ken, an Australian cricket coach and the tournament’s lead organizer. He was emphatic of how valuable an opportunity it was for Maasai to be able to participate in events such as these, particularly how it gave them the ability to travel and to forge relationships that could benefit them down the road. “At an event like this,” he said, “you’ve got wealthy people not just from Laikipia but all around the world. These guys can see the Warriors play and if they like what they’re made of – not just as athletes but as individuals, they could help them out with some sort of opportunity that could change their lives forever.” The sort of sponsor-driven mobility Ken was referring to was not a mere abstraction. It was not uncommon that foreigners visiting Laikipia’s group ranches would ‘adopt’ a family or an individual – particularly a man or women with athletic promise. On Sunday morning, the team arrived at the pitch anxious for their first game, but as we approached the field there was great unrest among them, directed at a man and woman sitting by the pitch dressed in Maasai regalia. As it turned out, the young man – named Kasana – was a suspended member of the team who had overseen managing their website and email account. A few months earlier, a dispute had erupted between Kasana and the team because, while in Nairobi attending university, he had conducted an interview and spoken about the team without insisting that all members be included. When I asked Olenku about the conflict, he said that Kasana had violated their constitution by using the team’s image for personal gain. I pointed out that if the team depended on digital publicity, that Kasana’s work while away at school was probably to their benefit. Olenku agreed that digital publicity was crucial to the team’s success, but that including all members in all decisions was fundamental to the team’s constitution. Accompanying Kasana was a small corps of Kenyan journalists who had contacted him via the team’s email wanting to do a story on their involvement in the tournament. Despite his expulsion Kasana was still the keeper of the team’s online existence, and as far as the media was concerned, Kasana’s invitation to film the team constituted sufficient permission. Olenku added that Kasana had brought journalists, and that they were being filmed without their permission. Ken became further agitated, and pointed out that the attention of journalists was crucial for their success. When the Warriors took to the field, I had the opportunity to hear Kasana’s side of the story. He explained that he was disappointed by the conflict enveloping the team. He verified that he had conducted media relations without his teammates, but claimed that because he possessed connections through university, it made sense for him to market the team in his own capacity. Since he believed he had acted in the team’s interest, he chose to attend the tournament in defiance of his suspension. Ken is interviewed by journalists while Kasana (left) assists with lighting. Kasana explained that the conflict was also routed in the team’s work against FGC. He explained that Beatrice, the young woman accompanying him, was helping him in a renewed effort to raise awareness about FGC. Kasana complained that the team were not genuine in their pledge to assist women, and that they had dismissed him when he tried to organize an FGC awareness event in Endana a few months before. The event went ahead without the team’s support, and Kasana claims that team was furious with him afterwards that their own sisters had not been included. We returned our attention to the pitch as the Warrior’s match neared its end. In the intense final minutes, the Maasai clinched a victory, and the crowd was pleased to see them redeem themselves after the previous day’s defeats. As it would soon be time to depart, Ledama was anxious to speak with Ken about the funds promised for transportation. Ken had not expected the team to be driven by a white associate, and there was no mistaking the fact that I was not charging the team for my services. I was just out of earshot when Ledama spoke to Ken, who was obviously very annoyed to hear him request 20,000 shillings. Ken responded by telling Ledama that any money spent that weekend would not be available for future travel opportunities. Sensing that my involvement had made the Warriors appear greedy, I advised Ledama to request only five thousand shillings, and to tell Ken it was for diesel. Ledama distributed the funds among the Warriors, who each used a portion to buy a small bundle of qat (a locally-grown stimulant) which they chewed quietly on the drive through Laikipia’s white ranches and back to Il Polei Group Ranch. For Maasai in Laikipia, and for other indigenous peoples around the globe, advocating for one’s community often involves departing from spaces of segregation and across landscapes that are racialized, fragmented, or traumatic (Niezen 2013). Segregated in Laikipia’s overcrowded group ranches, members of the Maasai Cricket Warriors and many of their families struggle daily to support themselves. But to seize the opportunity that the cricket team offers, they must subject themselves to the patronizing experience of entering into spaces where they are otherwise unwelcomed. Despite the politics enveloping the team, LMS felt all members were benefitting equally because attending the event was the ‘opportunity in itself’. The fact that Kasana was not playing on the field mattered little as, at least in the organizer’s mind, the real game was being played in the reception tent. But what many of the Maasai participants really wanted from their partner was an economic opportunity, and the social opportunities available under the tent required these men to perform stereotypical roles which not all were able or willing to fulfill. Though LMS may support the gender work of the team in theory, they fail to appreciate the extent to which the persistent failure of development projects among Maasai have largely been due to ambivalence on gendered issues (Hodgson 1999; 2011). 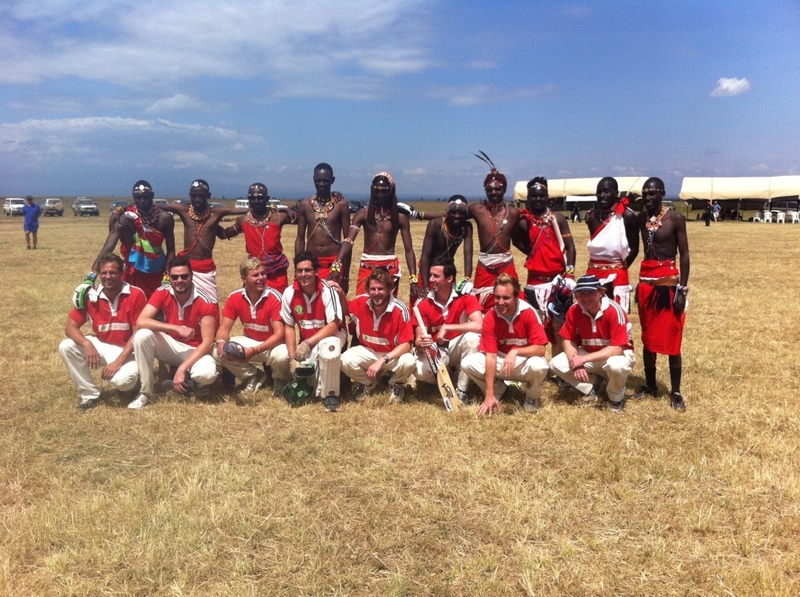 Maasai poses with team of British expats after defeating them in a consolation final. The conflict between Kasana and his former team also speaks to the importance of digital literacy in a neoliberal development setting. People with digital literacy in rural Kenya have the potential to become de facto gatekeepers for donors wanting to work with communities. The importance of digital literacy does indeed offer opportunities for youth empowerment, but like other categories such as ‘pastoralist’ or ‘women’, we must not overlook the uneven nature of the youth landscape itself. That Kasana had an advantage over his teammates due to his digital literacy was of no concern to the team’s sponsors. If the team could not present itself in a united and accessible fashion, their sponsors believed they weren’t worthwhile supporting. Overall, the issues that surfaced at this tournament reveal that Maasai must often lend dignity to racialized land structures if they wish to access livelihood opportunities. With recent land conflicts in Laikipia potentially signalling a wider ‘unsettling’ of white landownership in Kenya (McIntosh 2016), community-based development will undoubtedly remain a site where the marginality of Maasai is both produced and contested. Africa.” Visual Anthropology 15(3-4): 347-367. Stephanie Hanrahan, eds. Morgantown: Fitness Information Technology. Neoliberal World. Bloomington: University of Indiana Press. on Indian Residential Schools. Toronto: University of Toronto Press. The PDF version will soon be available on HAL.